You can build a relationship with fans through dialog and discussion. The more activity generated on your Page, the more stories are published to your fans’ News Feeds, which drives more awareness to the original action and creates a viral marketing effect. If you participate in one of these, post a picture of your child or pet, and then add a note that they’re doing a great job at helping Mom or Dad at work. Ask your fans whether anyone else takes advantage of this opportunity, and encourage them to post pictures as well. Ask your fans what they think. Be direct and ask fans what they think of your organization, new product, or position on a topic. 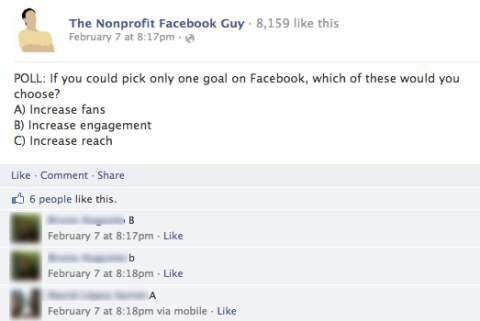 For example, The Nonprofit Facebook Guy regularly asks its fans to share their thoughts on various topics around Facebook marketing. Tell your fans how much you appreciate them. Don’t underestimate the goodwill gained by saying thanks. Thanking your fans for their questions or complimenting them on their comments can go a long way in social media circles. The clothing retailer Lands’ End is known for its exceptional customer service and its fans aren’t afraid to tell everyone about it! Highlight a success story. Another tactic that appeals to vanity is to highlight a peer’s success. She’ll be sure to thank you for the attention. Your other fans will appreciate hearing about one of their own making good. Many companies on Facebook run a Fan of the Month promotion and foster engagement by soliciting entries. Share your tips and insights. People are always looking for information that helps them do their jobs better. Don’t underestimate your knowledge and what you have to share that’s valuable. Sharing helpful tips is some of the best engagement around. 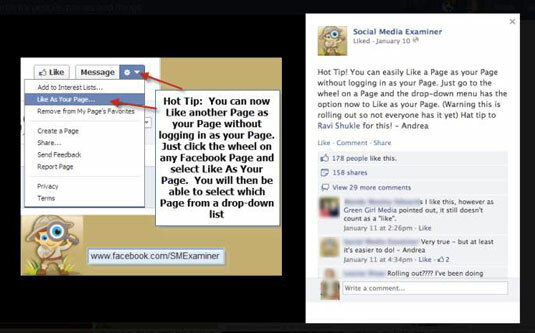 Social Media Examiner does a great job providing a steady stream of tips to its Facebook fans. Provide links to relevant articles and research. You don’t have to be a prolific writer to be valuable to your fans. By posting links to relevant articles, videos, resources, and research, you build your credibility as a content aggregator. Ask your fans what they think of something and test their knowledge using quizzes and polls. Again, appealing to the ego factor, quizzes and polls are popular tactics on Facebook. Mentos, the popular chewy fruit candy, regularly creates lighthearted polls using the popular Facebook Polldaddy Polls app. One of these polls was titled, “In the Fruit Pack of Mentos, Which Flavor Do You Save for Last?” This poll served the double purpose of allowing Mentos fans to share their opinions while also showing the company whether one flavor was preferred. Its marketing team can then use this information to better target future Mentos Page content and promotions.